Sadistic Intent formed in 1987. 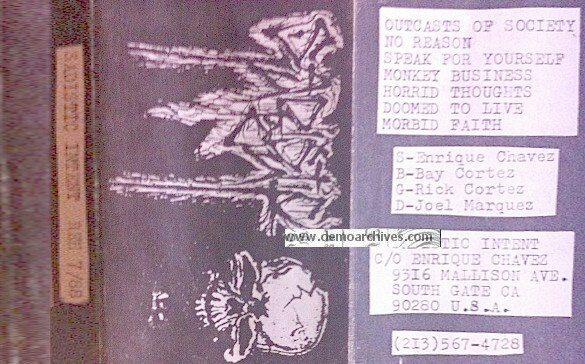 Two years later they released a small run of demo cassettes, called Conflict Within, followed by the release of a few rehearsal tapes and demos. Eventually Sadistic Intent signed with a rising label, Wild Rags Records. 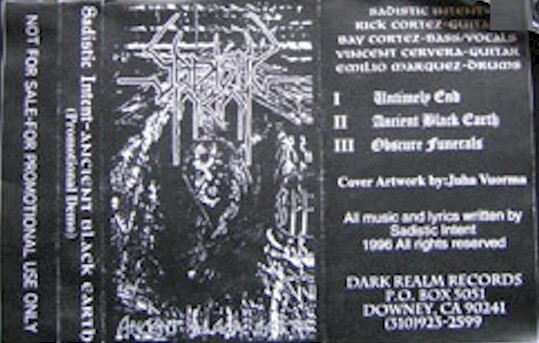 In 1990 the 'Impending Doom' EP was released and a few tours followed in Mexico as well as the United States. The following year, after bitter disputes with the label, they moved on and self-released a limited edition (1,000 copies) 7" EP A Calm Before The Storm. Due to line-up problems, the band would not release any material until late 1993. Any official demos/promos with covers? Printed covers. Tapes varied. Lyrics were on the back of the cover. Xeroxed covers. Tapes varied. No lyrics.